Huawei has confirmed that it will plunge £1.3 billion into the UK as it looks to enhance its research and development, local procurement and accelerate growth in blighty. Sky News initially reported that the Chinese firm was set to splash the cash in our own back yard, and now Huawei has announced this is the case, revealing that it plans to create 700 new jobs in the UK over the next five years. 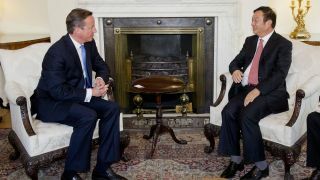 Prime Minister David Cameron held talks with Ren Zhengfei, founder and CEO of Huawei, in London to discuss the investment and Cameron said: "The investment announced by Huawei today demonstrates once again that the UK is open for business. "I welcome this and I want to see more companies invest in the UK as we work to achieve sustainable and balanced growth within our economy." Huawei has set its sights high, and plans to become one of the top three smartphone manufacturers in the world by 2015, certainly no mean feat and this latest investment could well be the next step for the fledgling Chinese firm. It's still a minnow in the smartphone pond, especially in the UK where the firm is still relatively unknown among consumers, and coupled with a name which many people struggle to pronounce correctly, Huawei could do with a bit of a boost. The firm also received an added boost today, after EE (formerly Everything Everywhere) announced the Huawei Ascend P1 LTE as one of five launch handsets for its 4G network, set to roll out in a few weeks time. The extra exposure for the Chinese firm, and the realisation by consumers that it's capable of producing not only budget devices, but flagship 4G smartphones, will no doubt aid it in its quest for mobile glory.